Join CDFA in Dallas, Texas for the 2018 National Development Finance Summit! The CDFA National Summit brings together the leaders and dealmakers in the development finance industry to discuss best practices, trends, and project financing solutions. The CDFA National Summit is designed for both public and private sector participants from all areas of the country. Attendees represent a diverse cross section of the development finance industry and bring unique perspectives, creative financing approaches, and interesting conversation to the event. The CDFA National Summit is a dealmaking event at its core with a program built to encourage networking and individualized learning about all types of development finance tools and programs. At the CDFA National Summit, you will meet industry experts, connect with financing, learn about the latest approaches, and discover development finance solutions to bring to your local community. CDFA Dealmakers Lounge: Your hub for networking and dealmaking, featuring Project Marketplace presentations and exhibitors. Project Showcase: Targeted sessions that highlight creative projects in the U.S. with discussions about structuring and sources of capital. Technology Showcase: Experience demonstrations of new technologies and software programs designed to support development finance authorities and initiatives. Training Courses: Targeted training featuring timely presentations and important trends in development finance. The CDFA National Summit features many opportunities to boost your networking and educational experience while in Dallas. A few of these special additions are highlighted below. Opportunity Zones: Maximizing Impact in Your Community: The Opportunity Zones event will bring together local communities, policy makers, and investors to discuss how to maximize the Opportunity Zones designations in low-income communities. National experts will be on hand for panel discussions, presentations, and workshops focused on how your community can take advantage of its Opportunity Zone designations, and how it can build strategies for identifying and working with Opportunity Fund investors. CDFA Project Marketplace: The CDFA Project Marketplace brings dealmaking to the forefront by featuring projects in search of financing with special presentations. CDFA National Summit participants are invited to comment on each project and offer technical assistance about potential solutions. Learn more about the Marketplace and apply to present on the Deals page. Intro Housing Finance Course: A one-day course offered by the CDFA Training Institute exploring how the development finance toolbox can be utilized to support a myriad of housing challenges and opportunities as well as how development finance agencies can become key partners in housing development in their community. This is an extra fee event. Intro Incentives Course: A one-day course offered by the CDFA Training Institute examining the role of economic development incentives in conjunction with other development finance programs and exploring how incentives can be used effectively and responsibly. In particular, addressing the characteristics of well-designed incentive programs and processes to ensure meaningful impact, value, and accountability. This is an extra fee event. Dallas Dining Adventures: Explore the Dallas restaurant scene featuring some of the best southern food in the country. Register in advance to secure your seat. Reservations will be made by CDFA, but you are responsible for your own transportation and meal charges. Networking: Networking abounds at the CDFA National Summit. View the Program page to see all of the exciting receptions and networking opportunities that are planned as part of the CDFA National Summit experience. Some events require reservations in advance and may require an extra fee. You are invited to register for the CDFA National Summit today! Your total registration fee will depend on what events you plan to attend. Special discounts are available for CDFA members and multiple registrations from the same organization. View the table below to see the registration rates, or visit the Registration page for more information. 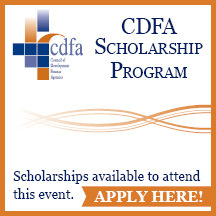 CDFA Scholarship Program and submit your application today.